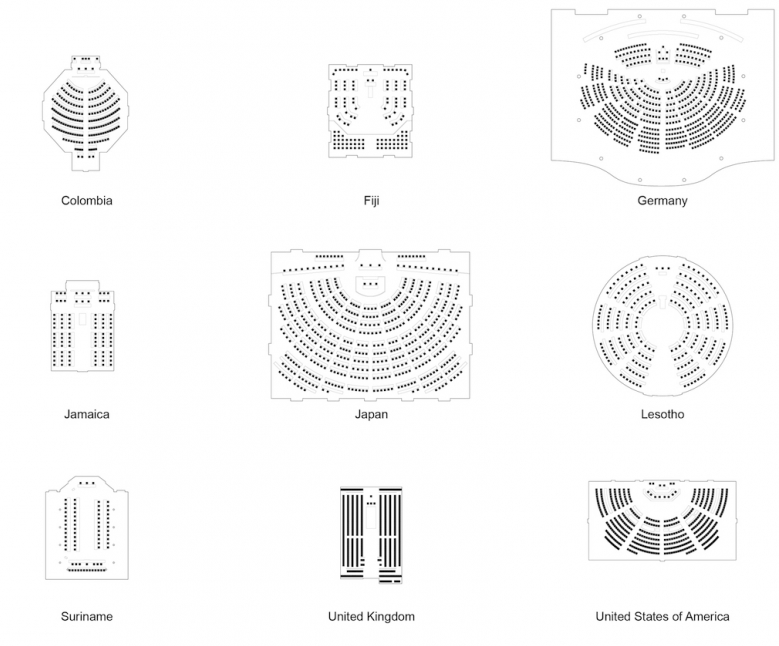 After having my interest piqued regarding different legislative bodies around the world, I tried my hand at surveying parliaments by their emblems but this uniform and minimalist approach, via Nag of the Lake, which an Amsterdam-based design firm has taken is immediate, imagining how spaces of assembly and debate are influenced, restricted or otherwise facilitated by comparing and contrasting the seating layout of various national and supranational constituencies. 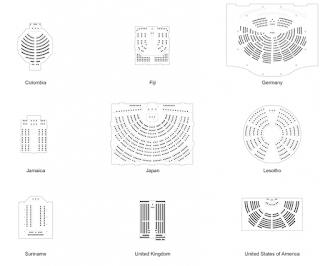 Most parliaments adhere to five typologies (architecturally-speaking, the layout, the accommodation)—opposed aisles, classroom, semi-circle, horseshoe and tending towards full circular. These theatres in the round are typical for newly constituted legislatures and are most democratic, according to the authors’ research—while a semi-circular typology is most conducive of consensus-building, but I also suppose that the number of parties would factor in as well. Other, arguably outmoded set-ups seem to hinder governance.